There was a six week gap between the two South American races and the South African GP (the 300th World Championship event) and in that time several new cars had been completed. As a result there were 30 cars fighting for 26 places. Ferrari had its new 312T3s ready, Brabham appeared with the strikingly-different BT46 with angled heat-exchangers instead of radiators. Automobiles Martini appeared for the first time with Rene Arnoux driving the Tico Martini-designed MK23, while Arrows expanded to two cars, running Riccardo Patrese and Rolf Stommelen in Warsteiner Beer-sponsored cars. Renault Sport was also back in action after missing the first two races. There had been some changes in the driver lineup with Eddie Cheever moving from Theodore to Hesketh (where he replaced Divina Galica) and Keke Rosberg being hired by Theodore. Ensign was running only one car (for Lamberto Leoni), Danny Ongais having given up his ideas of being an F1 driver. 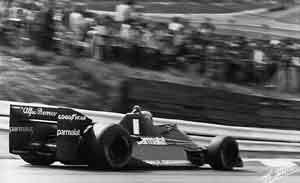 Niki Lauda showed the promise of the new Brabham by taking pole position ahead of Mario Andretti (who was still using the old Lotus 78). The two McLarens of James Hunt and Patrick Tambay shared the second row while Jody Scheckter's Wolf and Jean-Pierre Jabouille (in the turbocharged Renault RS1) were on the third row. Then came Patrese, Gilles Villeneuve and Carlos Reutemann (Ferraris) and John Watson in the second Brabham. Cheever qualified 25th to become the third youngest driver ever to start a Grand Prix. In the race Andretti took the lead with Scheckter getting ahead of Lauda. Hunt followed with a fast-starting Jabouille ahead of Patrese and Watson. Hunt went out after five laps with an engine failure, while Patrese was quickly ahead of Jabouille. On lap 19 the young Italian overtook Lauda for third place. On the 21st lap Scheckter managed to get ahead of Andretti and he was followed through by Patrese and six laps later the Arrows went into the lead. As both Andretti and Scheckter dropped back with tire problems, Patrick Depailler (Tyrrell) moved to second with Lauda third. The Austrian's car lasted only until lap 52 when its Alfa Romeo engine blew and so Andretti regained third place. Patrese seemed to have the race in his pocket but on lap 64 his engine blew and Depailler went into the lead with Andretti second and Peterson third. In the closing laps the Tyrrell began to trail smoke but Andretti could do nothing because with three laps to go he had to pit for more fuel. This left Peterson to get ahead on the last lap after a dramatic wheel-banging battle with Depailler. The Frenchman finished half a second behind the Lotus. John Watson was third in his Brabham with Alan Jones fourth in the Williams, Laffite fifth in the Ligier and Didier Pironi sixth (to score his second point in three races).